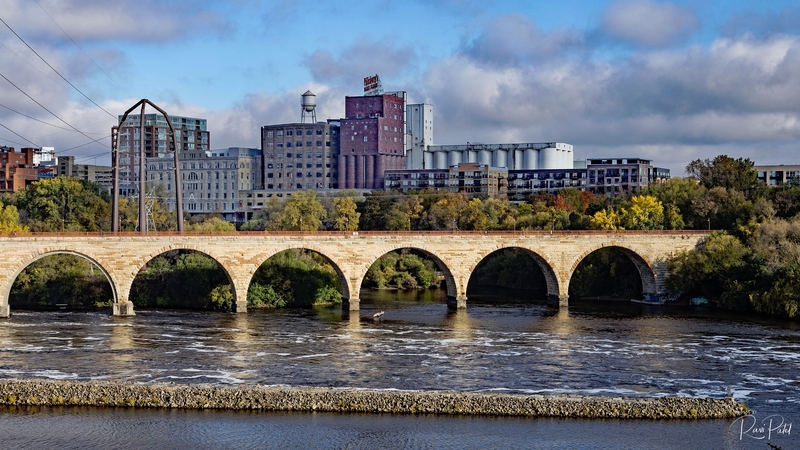 The Pillsbury A-Mill, seen here behind the Stone Arch Bridge, held the title of largest flour mill in the world for 40 years. Completed in 1881, it was owned by Pillsbury and operated two of the most powerful direct-drive waterwheels ever built, each generating 1,200 horsepower (895 kW). The mill still stands today on the east side of the Mississippi River and has been converted into resident artist lofts. This entry was posted in Landmarks, Photography, Travel and tagged Bridge, mill, Minneapolis, Mississippi, Pillsbury, Saint Anthony Falls, Stone Arch Bridge. Bookmark the permalink. I love this pic! The stone bridge with the industrial buildings as backdrop… so cool!